With a commitment to its vision of Everyone in Harmony, the Barbershop Harmony Society announces a new scholarship opportunity for persons of color to explore a musical art form whose origins lie in African American communities of the South in the 19th century. The Grand Central Red Caps Endowment has been established to provide scholarships and other supports to encourage the broadest possible participation of promising barbershop singers, music educators and directors of color. An initial $50,000 commitment by the Barbershop Harmony Society and a $50,000 gift to Harmony Foundation International from Dr. Bart Campbell of Nashville launched the initiative. BHS President Skipp Kropp was joined in making the announcement at Harmony Hall in Nashville on February 20 by CEO Marty Monson; Perry White, CEO of Harmony Foundation International; Dr. Campbell; and H. Beecher Hicks, CEO of the National Museum of African American Music, which soon will make its home next door to BHS in a 56,000 square foot facility located at the Avenue of the Arts in the redevelopment project of the former Nashville Convention Center. Last summer, the Barbershop Harmony Society began an ongoing effort to acknowledge and begin to rectify the injustices of the past, beginning with the Grand Central Red Caps. (See link to complete story and video.) 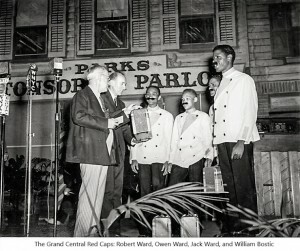 As a first step, the four members of the Grand Central Red Caps were posthumously named Lifetime Members of the Barbershop Harmony Society. “The National Museum of African American Music will be the place that educates, preserves, and celebrates the rich influence Black people have had on America’s music -- including barbershop harmony,” said Mr. Hicks. “This effort by the Barbershop Harmony Society rebuilds historical bridges and points to a richer musical future that brings together everyone in harmony. “We see this as just the first step in a campaign of awareness to invest in the engagement of future harmony singers, directors and educators of color. Our musical heritage can become a medium through which we create dialogue, friendship and a binding sense of community,” said Monson. This event announces the first scholarships proceeding from this effort, to encourage the broadest possible participation from four individuals to experience a week of instruction at Harmony University in Nashville in July 2018. We hope to assist promising barbershop singers, music educators, and directors of color. Men and women are encouraged to apply.